Underneath the spoon and the ties is a 9" x 13" pan. I saw this pattern a few months ago and finally ordered it, thinking how easy it would be to make and what a great gift it could be. After spending the morning making this, here's what I've discovered. 1. It is a nifty idea. 2. It would make a great gift. 3. This pattern isn't difficult, but it is time-consuming. 4. This gift is not a casual one considering the time invested, the cost of the fabrics, and the cost of the pan and the spoon. This carrier is made from two quilted rectangles, one of which is 10" x 34" and the other is 18" x 34". Both of these rectangles must be bound. There are also two ties, 1" x 40". The narrow end flaps are folded over the pan. Then the two sides are folded over than and tied. The wooden spoon becomes the handle for this tidy little package. See the top picture for the finished bundle. I think I will make a couple of these, but I won't crank these out in great numbers. Now that I've made one, I think the second one will be sent to my cousin Jerry White in Kansas - he's the woodworker and perhaps I can get some spoons in exchange for a carrier. Jambo is "Hello!" in Swahili. What a terrific time we had in Kenya and its national parks of the Great Rift Valley and Amboseli. Fabulous people, wonderful animals, and the best weather ever. 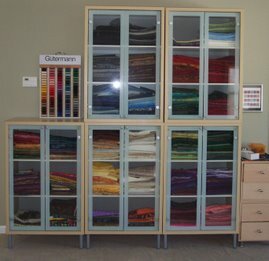 My brain is just agog with all the possibilities for the Quilting Studio. Look at this scene from Amboseli with Mt. Kilimanjaro in the background. There's a landscape quilt which will eventually emerge - I still have 800 other photos to consider. These two t-shirts along with the Kenya flag will make a great wall hanging. Originally I bought 4 t-shirts thinking that I would do a square wall hanging. Then I decided to break up the 4 t-shirts into 2 separate wall hangings. The remaining two will be a wall hanging for my sister Paula and her husband Dennis, who went to Kenya with us. Great fun to travel with them! Use your imagination. Surround these shirts with red, black, green, or yellow. If you're a faithful reader of this blog, then you k now I have a thing for purses and bags. This zippered bag is great. I love the zebra print mixed with the cheetah print. And the animals? These were the animals we saw - constantly. I'm not sure whether I will use this bag in the studio, imitate it for its size and pattern, or use its palette as a design source. This whole cloth is 40" by 60", and the Maasai use it as a wrap - it's a kanga. If you look closely (click on the picture), you'll see words in Swahili. A loose translation is "God controls the rhythms of our lives." I am going to quilt this and use it as an opportunity to work on my free-motion skills. I was a bit disappointed to learn that this kanga is a product of Tanzania since we officially didn't visit Tanzania. Unofficially? We actually did. Our balloon ride came to a swift end when we began to sail into Tanzanian territory, and we did a quick crash landing! One of the nice surprises when we returned home was the arrival of my 2010 blog in book form, ordered from blog2print.com. Although my blog is securely on line, it's great to see all the entries from 2010 and be able to page through them. This volume will sit on the bookshelves along side the 2007, 2008, and 2009 volumes. Be it ever oh so humble, there's no place like home! My bags are packed. Well, actually they aren't. Just yet. My 60" x 80" zone is no longer a reference for a queen-size bed. It is now the "what goes into the suitcase" zone. We leave for Kenya on Friday and will be gone two weeks. T-shirts, long-sleeved shirts, convertible pants, multi-purpose vest, a pair of shorts, a swim suit, pj's - that's it. I still have another day to refine this pile. But the studio is closed and now a staging area for packing. Kwaheri! That's "goodbye" in Swahili, which besides English is the official language of Kenya. I'll be back the end of this month! 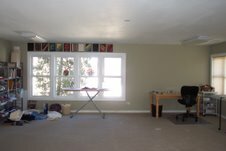 This foundation-pieced Attic Windows is an example of reversible quilting. It was my coaching sample when I was teaching this technique in 2007. The inspiration was a packet of fat quarters and how to best display them in a quilt. It's been sitting in my studio ever since, just waiting for the right occasion and/or the right spot. My living room has a lot of red, white, and green in it. I'm hoping this quilt will neutralize this color scheme! And in another two months I can turn this quilt over and display the other side! 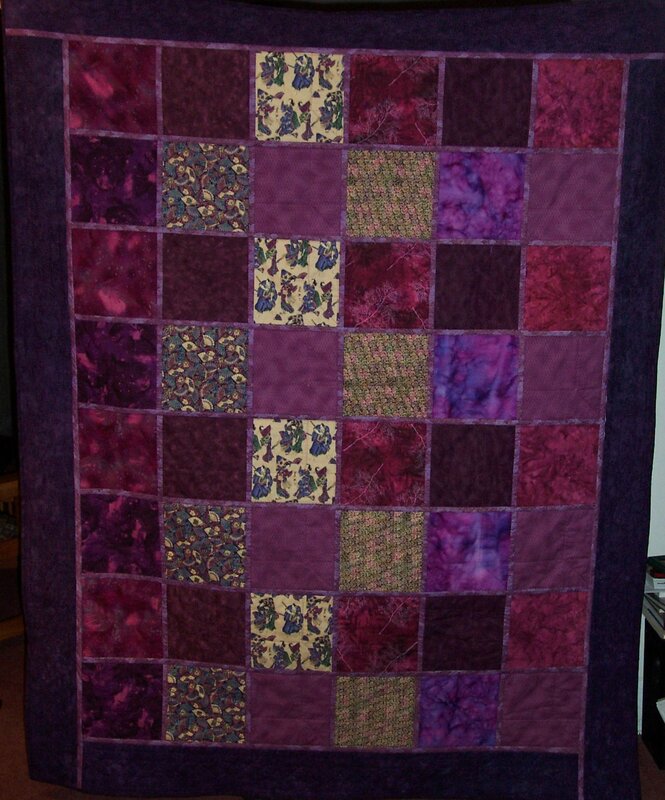 Here are pictures of both sides of the quilt. After working on stippling the border of this quilt and seeing the living room without all of its Christmas decor, I decided to move this Storm at Sea from its almost hidden spot to a part of the living room that is much more visible. But this spot needs a piece with a portrait orientation rather than landscape. This piece is about the source of light, and there is a window just to its left. Although this piece was designed as a landscape design, I do think the portrait orientation works with this piece in this spot. Stippling the border makes this quilt lie flat - a good thing! 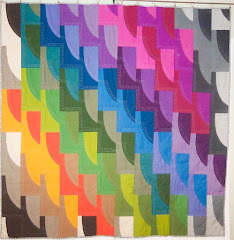 These blocks both share the same fabrics and one common dimension - 12". They, along with some extra purple strips, are going to be part of quilt that others are contributing to as well. 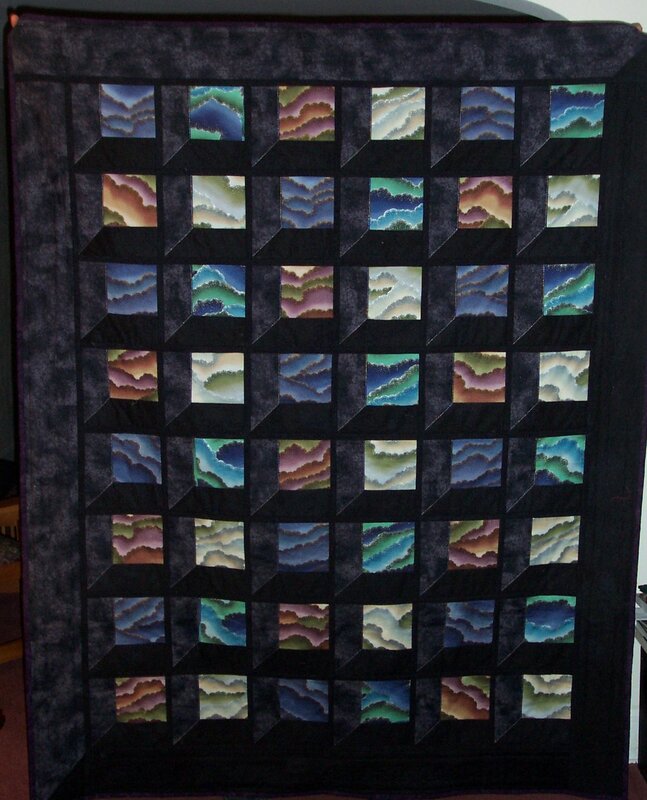 In late March I hope to be able to post and blog about this quilt. Meanwhile, these blocks are off to mingle with others. I hope they play nicely with the others without being too loud and domineering. Here's the corner of a piece that I've had hanging in my living room. John took it down for the holidays. Before it goes back up, I am stippling (free motion quilting) the outer border and adding a sleeve for hanging. This is a Storm at Sea, and I love the look of it. My buddy Wayne was working on his Storm at Sea, and here's what he made. I know this is immature, but whatever Wayne is working on, that's what I want to do, too. I was proud of embellishing this quilt with some neat yarns from John's sister. And I love this quilt so much that I was too hasty to get it hung. So now, I'm completing it properly. ...and for all reasons. The top bag is 7" x 9", started as an 18" quilted square, and is perfect for carrying cash, credit cards, passport, sun glasses,chapstick - you know, life's essentials. The middle bag started as a 21.5" quilted square and is now a 9" x 11" bag - perfect for a Kindle and its charging equipment. Fellow CPS retiree Carol Conway received a Kindle for Christmas from her family - and this bag is a belated birthday present. This bottom bag is just perfect for carrying an iPad. It's 10" x 12" and began as a 24" quilted square. Full credit for this original pattern goes to the Jinny Beyer website. And I must quickly add how terrific it is to work in a clean and organized space. I don't know what's going to help this board of scraps. I paid grandson Brandon to organize and sort, but that was several months ago. It must be time for another scrap quilt. 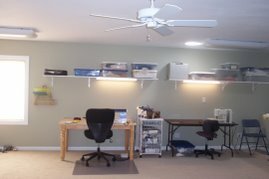 I've got some great surfaces, but all of them are covered with odds and ends that simply must be organized and put away. Fabrics on the floor must go into the cabinet, and the table to the left? I don't even know what all is there. My cabinets are terrific, and I need to make them more efficient. My standing tables are covered with fabrics that were used for purses and bags or fabrics that I thought I would use and bits and hunks of different weight battings. I'm not finished making purses/bags, but these fabrics have to be put away. So stay tuned for some "after" pictures - I have great hopes for tomorrow. We leave for Kenya in less than two weeks. Starting new projects just isn't going to happen. And things in other parts of my life are getting busy. Maybe in early February I can do the sort of "project dreaming" that I normally do at the beginning of a new year! Elongated Drunkard's Path - 70" x 70"